The findings are reported online in the journal Cardiovascular Diabetology. 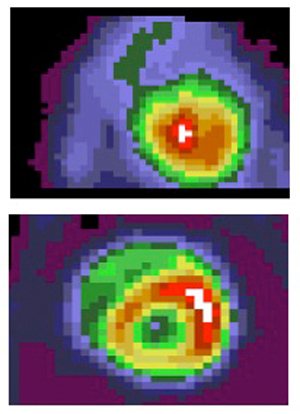 PET images from patients with blood sugar and lipid problems and other metabolic complications (top) show the heart has difficulty converting glucose to energy. In those without metabolic complications (bottom), the heart more effectively converts glucose to energy. The researchers say the findings were surprising because metabolic complications like insulin resistance, diabetes and problems with blood lipids — such as cholesterol, triglycerides and fatty acids — have become common as improved drug therapies enable patients with HIV to live longer. These complications also tend to strike HIV-infected people at a younger age. Scientists have long speculated that these problems are caused either by the virus or the antiretroviral therapies used to prevent the infection from progressing to full-blown AIDS. The scientists used positron emission tomography (PET) imaging and echocardiography to study the heart in four groups of patients: 23 HIV-positive men with metabolic complications; 15 HIV-positive men without those problems; nine HIV-negative men with metabolic complications; and 22 HIV-negative men without them. The PET studies measured how well the heart processes glucose, an indicator of how well the heart converts sugar into energy. The echocardiograms measured heart function, in particular the ability of the heart to relax between beats, known as diastolic function. 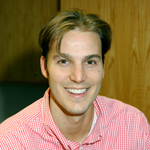 But the effectiveness of anti-HIV drugs may explain why heart function among HIV-positive men in this study was not worse than that of their HIV-negative counterparts, Cade says. Cade says it’s possible that if a larger study were conducted, researchers may be able to tease out very small differences in heart function between HIV-positive and HIV-negative men. Cade WT, Reeds DN, Overton ET, Herrero P, Waggoner AD, Davila-Roman VG, Lassa-Claxton S, Gropler RJ, Soto PF, Krauss MJ, Yarasheski KE, Peterson LR. Effects of human immunodeficiency virus and metabolic complications on myocardial nutrient metabolism, blood flow and oxygen consumption: a cross-sectional analysis. Cardiovascular Diabetology, Dec. 2011. (Epub ahead of print). Funding for this research comes from the National Institute of Diabetes and Digestive and Kidney Diseases and the National Center for Research Resources of the National Institutes of Health (NIH), and the NIH Roadmap for Medical Research.